Is your hotel located near Ambassadors Theatre? Get in touch now to be listed on this page. The Z Hotel is perfect for active travellers on a moderate to slightly tighter budget and are looking for a classy place to rest their heads after a long days sightseeing. One of the best things about this hotel is its location. Situated just off of Charing Cross Rd, the hotel is perfectly situated for Theatreland and the thrills of London’s night life! The rooms themselves are small but comfortable, each with bespoke hand crafted beds and en suit facilities with complimentary toiletries. The hotel also hosts its own happy hour with complimentary cheese and wine! Call 020 3551 3701 for reservations and further information. 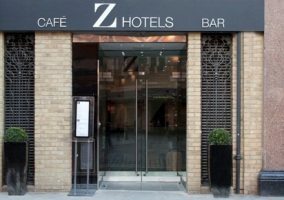 Reviewers on TripAdvisor have given The Z Hotel Soho 4 out of 5 stars. The Covent Garden Hotel is a luxury hotel situated right in the heart of London and ideally located for a trip to Theatreland. This stylish hotel has plenty of guest areas such as its own drawing room and library inspired space in which guests can relax or entertain friends. The hotel has its own Brasserie that serves a pre-theatre menu as well as hosting daily afternoon tea (perfect for those wishing to take in a matinee performance). The hotel comes equipped with a gym (with complimentary access for guests), spa therapies and the possibility of private Yoga sessions. There is also a cinema in the hotel that plays host to weekly film nights on a Saturday. There are a variety of room options with the most basic of which provides WiFi, a flat screen TV, iPod docking, en suite facilities and toiletries and the more premium rooms providing breakfast, champagne, fresh flowers and gift boxes. Call 020 7806 1000 for reservations and further information. 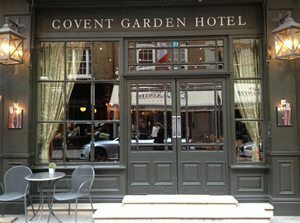 Reviewers on TripAdvisor have given the Covent Garden Hotel 4 out of 5 stars.